For years we’ve perfected our doughnut recipes and have created one that is light, airy, and savory. 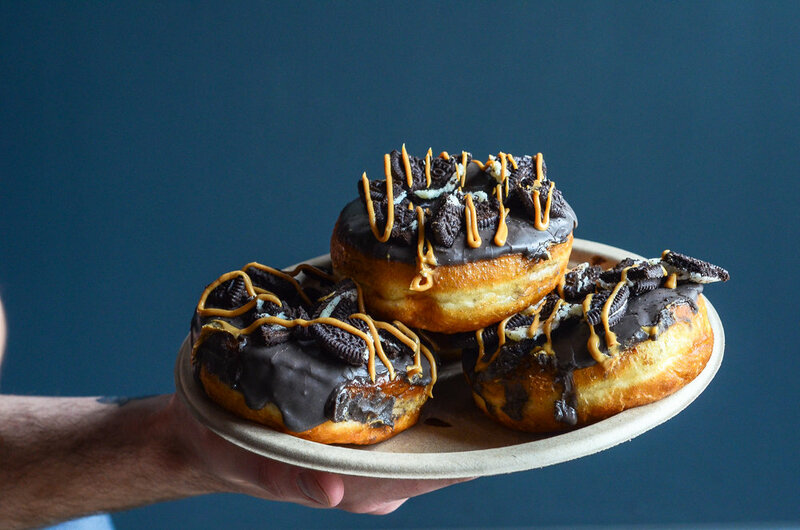 We make yeast-raised doughnuts with the best ingredients available. We always offer a variety of vegan options. We believe that delicious food can be created responsibly using locally sourced ingredients whenever possible, and we treat our employees equitably and give back to the community. People often ask us why we chose the name “Pepperbox”. One of the legends of the invention of the doughnut involves an American sea trader in the 1800’s who was tired of his fried cakes always being uncooked in the middle. As a result, he punched a hole in the center of the dough with the ship’s tin pepper box, and thus was born the doughnut (or “donut”) that we know and love. We have recently signed a lease for our first brick and mortar in the burgeoning South End area of Charlotte, our hometown, and hope to have many more stores in the future. In addition to our signature doughnuts, our retail location will offer plain glazed and chocolate glazed doughnuts, coffees, teas, and an innovative non-alcoholic beverage program. We are working on opening our first brick and mortar! We are targeting a spring opening in the design Center of the carolinas, off of camden road in Charlotte, across the alley from the new Jeni’s Ice cream! We love catering for large events, and will create catering orders over two dozen just about anytime. Email us for more details! If you are looking for catering, have an upcoming event, or any doughnut-related questions, let us know!